Goal : Exploring epigenetics in this short video by using it as an educational tool to explain the concept in a simple and playful manner using the process of vernalization. Concept : The scenario explores the key themes of change; gene silencing, adapation, reprogramming and the possible affects of climate as a contributing environmental factor enabling this. 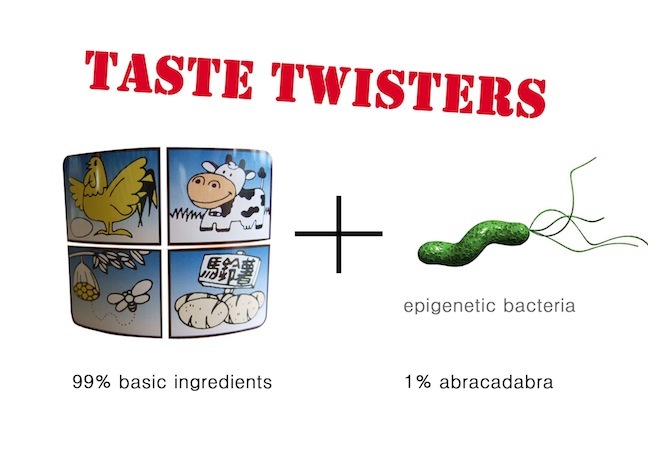 These issues are explored within various scenes based on the dicoveries made by a weather scientist, who experiments in her kitchen to find an unknown and hidden ingredient that leads to the discovery of ‘the taste twisters,’ where the taste of the product changes in different weather and temperature conditions. This idea is based on the premise that the information stays the same, i.e. the product is a fixed template but the interpretation, i.e. the ‘taste’ depends upon the environment or variable conditions in which it is eaten that makes it different. As a result the product is durable as it provides alterantive or multi tastes making it emotionally sustainable for the person eating it.